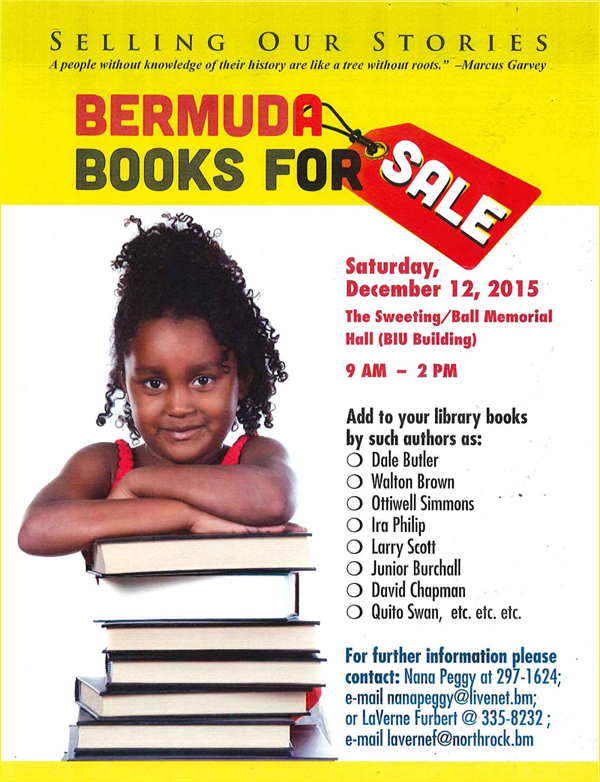 A sale of books by Bermudian authors has been organized for Saturday, December 12, 2015 at the Dr. E.F. Gordon Memorial Hall beginning at 9:00 a.m. and ending at 2:00 p.m. The organizers of the book sale, MP Walter Roban, [Nana] Peggy Burns and LaVerne Furbert believe that this was an opportune time to expose and sell the books by Bermudian authors that have not been sold in the traditional method that is through the book stores in Bermuda. As we are approaching the Christmas season, the organisers also felt it was an good time for people to purchase books as gifts for their family and friends. “Some of the authors’ books had been sitting for more than twenty years in boxes – inside and outside of their homes while others were warehoused,” shared Nana Peggy. “We decided to bring these books together under one roof to sell for and on behalf of the authors”. In addition to books by authors such as Ira Philip, Walton Brown Jr., Larry Scott, Dale Butler, Dr. David Chapman, Dr. Quito Swan, and Ottiwell Simmons, they will also have books by Dr. Joseph Christopher, Elizabeth Kawaley, Dr. Eva Hodgson and others. Some of the books that will be available are currently out of print but can be purchased at our book sale. “We are encouraging people to attend the book sale, purchase the books written by us, about us and for us, and gear up for an island-wide family competition to be designed using the books,” added LaVerne Furbert. For further information, interested persons should contact either Peggy Burns at 297-1624 or LaVerne Furbert at 335-8232. Why are they only selling books from one segment of our population? Why not use this as an opportunity to celebrate all our local authors and support them during this holiday season? Glad somebody else noticed that one. It sort of slaps you in the face. Imagine being slapped in the face for the past few centuries!!!!!!!!!!!!!!!!!!!!!!!!!!!!!!!!! Not a good feeling is it! Need look no further than the organizers! Great venture.. hopefully it will be successful. As mentioned in the article. quote: In addition to books by authors such as Ira Philip, Walton Brown Jr., Larry Scott, Dale Butler, Dr. David Chapman, Dr. Quito Swan, and Ottiwell Simmons, they will also have books by Dr. Joseph Christopher, Elizabeth Kawaley, Dr. Eva Hodgson and others . To Sam I Am , i think the ‘addition segments’of the population may be included in the ‘and others’ I certainly understand the tendency for us to see that ‘us and them’ in almost everything, hence, i encourage all of us to aspire to be optimistic about the change that can happen in Bermuda our children need to know it’s possible.